There are three different types of anesthesia that can be administered to help patients feel at ease during a dental procedure. Local Anesthesia numbs only the area of your mouth that is being treated. This is done with a type of injection. You are awake and aware of what is happening. Conscious Sedation is a mild sedative that relaxes you. You stay awake, but may not remember the procedure afterwards. This is done in conjunction with local anesthesia. 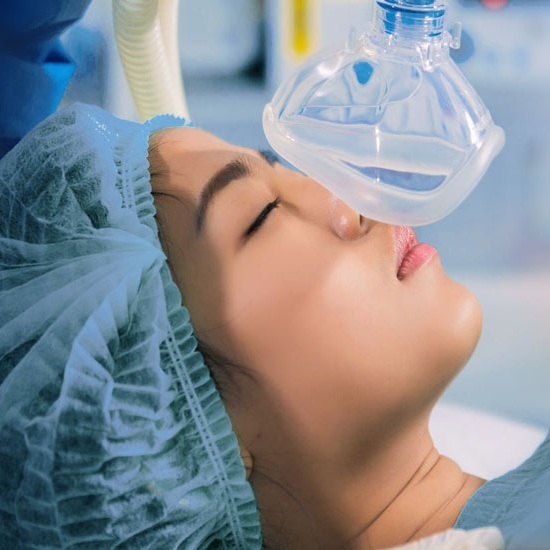 General Anesthesia allows you to be unconscious (asleep) during your dental procedure. You should not feel any pain during your procedure. This is done in conjunction with local anesthesia. Please arrive early for your first visit if you haven’t already completed your health history forms. Bring your insurance ID cards (if applicable) as well as records from your previous dentist if available. It can be helpful to make a list of any questions you have for the doctor before you come in, as it can be easy to forget something you want to ask about on your visit. If you are nervous about visiting the dentist please let us know so we can make sure to put you at ease. We want to make your visit as pleasant as possible and strive to provide a warm caring environment in order to serve you. Children under the age of 18 should be accompanied by their parent or legal guardian on their first visit. Please let us know if you have any special needs before coming in for your appointment so we can do our best to accommodate you. We look forward to seeing you soon! It is our mission to insure that you receive quality & affordable dental care. We participate with most major dental insurance programs; we accept insurance as either full or partial payment toward treatment. Our office staff will inform you of necessary co-payment or deductible of your insurance policy in advance. All insurance paper work and filing of claims is done by our staff, to better assist you. We work with the following Insurance Plans listed below. If you do not see your Insurance Plan here please call us. If you are in need of a single tooth implant, you have come to the right place. At the NYC Center for Dental Implants, our trusted team of experts has the knowledge base and skills to outfit you with a high quality, long lasting implant in no time at all. With top-of-the-line modern technology, we are able to provide the most accurate diagnosis and care. If you are not in need of a full set of dental implants and would like a single tooth implant instead, read on to learn more about what this service involves. When you lose one of your teeth, whether it be due to illness, injury, or any other cause, you may be feeling insecure and unsure of where to turn next. While there are many options out there, dental implants outweigh bridges and dentures in terms of durability, aesthetics, ease, and convenience. If you are missing a single tooth, a dental implant will replace both your natural tooth and its root. First, the implant, which looks like a screw or cylinder, is inserted into your jaw. The implant and the bone is then bonded together to create a foundation for the artificial tooth to adhere to. Lastly, the crown will be attached to the abutment and the implant will be completed. At the NYC Center for Dental Implants, we offer reasonably priced dental implant services for all of our patients. If you would like to learn more about our single tooth implant services, please contact us to get all your questions answered. We look forward to improving your smile!